Remember When The Goddess Kali Took Over NYC’s Empire State Building? The Goddess Kali took over New York City back in 2015 , and it was truly breathtaking! The Hindu goddess was displayed on the facade of a building that is synonymous with New York – the iconic Empire State building. Artist Android Jones designed the fierce portrait of Kali, who is the Goddess of Time, Change, Power and Destruction, to make the point that Mother Nature – now more than ever – needs a fierce avatar to fight the dangers of pollution and extinction. It was the last, most captivating artwork in the exhibition by filmmaker Louie Psihoyos, titled, Projecting Change, which projected pictures of endangered creatures onto the NYC skyline, with San Francisco-based Obscura Digital. It was meant to spark awareness of massive wildlife extinction, and to draw attention to the alarming rate at which species are dying. The show ended with a representation of Kali – the goddess of darkness – imploring people the world over to fight darkness and take up conservation. It was a perfect image to show the ecological consciousness and how Mother Nature needs a fierce avatar to fight the dangers of pollution and extinction. 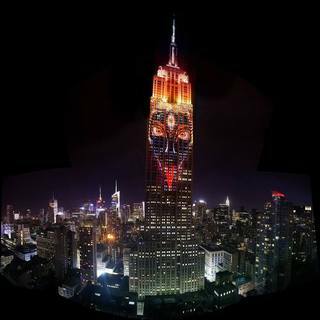 Apart from Maa Kali, Cecil the lion, and other hundreds of nameless endangered animals were showcased on the Empire State Building.